Industrial Security allows your FortiGate’s IPS security profile access to a continuously updated list of signatures developed for Industrial Control Systems (ICS) and SCADA (supervisory control and data acquisition) protocols. These are a must for companies protecting or accessing industrial machinery and utilities. 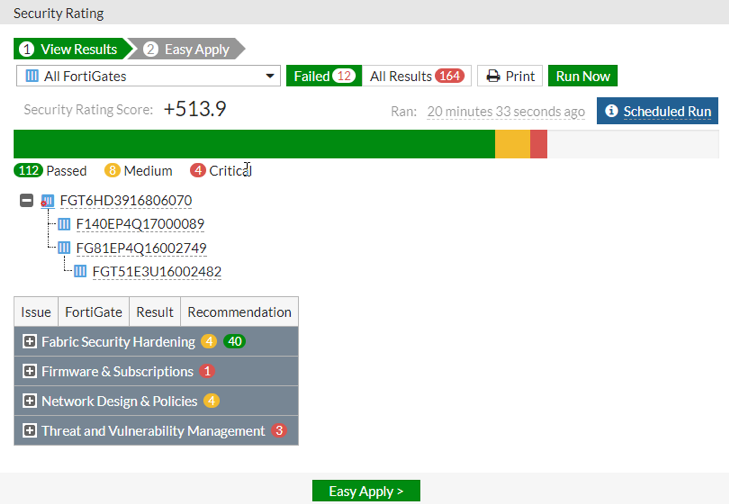 The Security Rating feature (previously called the Security Fabric Audit in FortiOS 5.6) is a built-in vulnerability and best practice scanning tool for all the Fortinet devices that are a part of your Security Fabric. 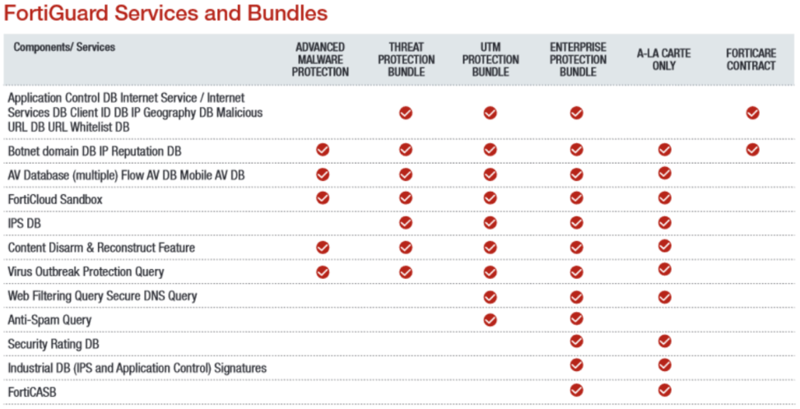 The subscription provides your FortiGate a constantly updated list of these security posture checks so that as best practices change, and new vulnerabilities emerge, you are ensured that the Security Rating provides up-to-date information. FortiCASB is Fortinet’s cloud-native Cloud Access Security Broker (CASB) service which, using direct API access, enables deep inspection and policy management for data stored in cloud application platforms. Your subscription will provide you access to the service at forticasb.com where you can then connect FortiCASB to your organizations cloud platforms, such as Office365, Box, Dropbox, Google Drive, and Amazon AWS. The FortiGuard UTM Protection has one additional service – it now includes FortiCloud Sandbox. FortiCloud Sandbox provides an antivirus sandbox environment where suspicious files will be sent and run on isolated VMs. Once a suspicious file is “live” in that environment, FortiCloud Sandbox will analyze the file’s behavior in order to detect known and zero-day threats. FortiCloud Sandbox is NSS Labs “Recommended” for breach detection and ICSA labs certified for advanced threat defense.